This article first appeared in The Edge Financial Daily, on December 7, 2017. A trip to Genting Highlands now takes on a three-dimensional (3D) appeal with the showcase of Adventures of the Monkey King: The Golden Hooped Rod held at the Genting International Showroom. The 65-minute showcase is set to steal high rollers’ attention with China’s award-winning Nanjing Acrobatic Troupe’s acrobatic performances aided by 3D visual effects. Their top-notch physicality, malleability and gravity-defying moves are vital in expressing the show’s story about a battle between good and evil, inspired by the classic folktale Journey to the West. Before Adventures of the Monkey King started in China in 2016, the Nanjing Acrobatic Troupe members with different skills had performed in many other shows. The troupe has won awards from acrobatic competitions, and the prestigious President de la Republique prize at the Festival Mondial du Cirque de Demain (Worldwide Festival of the Circus of Tomorrow). 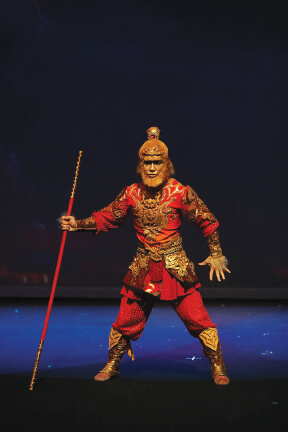 With the initial plan to only perform Adventures of the Monkey King in China, the troupe, led by 45-year-old leader Chi Wen-jie, decided to take it abroad after the show drew greater acclaim. One Universal Production, a Malaysian production company, brought it to our shores due to its universal appeal, suitable for diverse audiences. One Universal rewrote the story from scratch, focusing on the monkey king, unlike the original version with several mythical characters. However, the translations were rather amusing in their overly simplistic and naive manner. The show relies on the beauty of live action theatre instead of one with minimal props. Using two 20m by 8m projector screens and LED lighting, various motifs and patterns come alive vividly, with great depths and attention to detail. The use of saturated colours at parts is particularly alluring, and the mise-en-scene is thankfully rather seamless. Yet, these do not distract from the troupe’s agility in executing bold moves. Overall, it is an ideal family entertainment with fast-paced action and plenty of razzle and dazzle. Translations in English are shown on two projector screens next to each side of the stage for more convenience.